In the pantheon of championship droughts, Class A Advanced Visalia's may not measure up to the more publicized Major League versions broken by Boston or Chicago. But 40 years is a long time to wait ... long enough that first-year manager Joe Mather wasn't born the last time the franchise hoisted a California League championship flag. His club is three wins away from doing so, thanks in large part to Daulton Varsho. Arizona's No. 5 prospect hit a three-run homer and four pitchers combined on a two-hit shutout as Visalia defeated Stockton, 3-0, on Sunday night to advance to its second Championship Series in three years. Visalia became the first team on the circuit since Inland Empire in 2013 to advance to the Finals without a winning record. Mather's club finished 70-70, a one-game improvement from last season when they missed the playoffs. First-inning singles by Camden Duzenack and ninth-ranked D-backs prospect Drew Ellis set the table for Varsho. The backstop drove Matt Milburn's 2-0 pitch over the fence in right-center field for a 3-0 lead. Ellis added another single and Duzenack, who went 9-for-20 with three multi-hit games against the Ports, added a base knock and a walk for the Rawhide, who managed four hits over the final eight innings. That was more than enough, however, for Visalia's pitchers, who led the league with a 3.73 ERA during the regular season but allowed 26 runs through the first four games of the playoffs. Starter Sebastian Kessay delivered 4 1/3 hitless innings -- striking out five, walking two and plunking a batter during his first outing since Aug. 11 and his fourth this season. 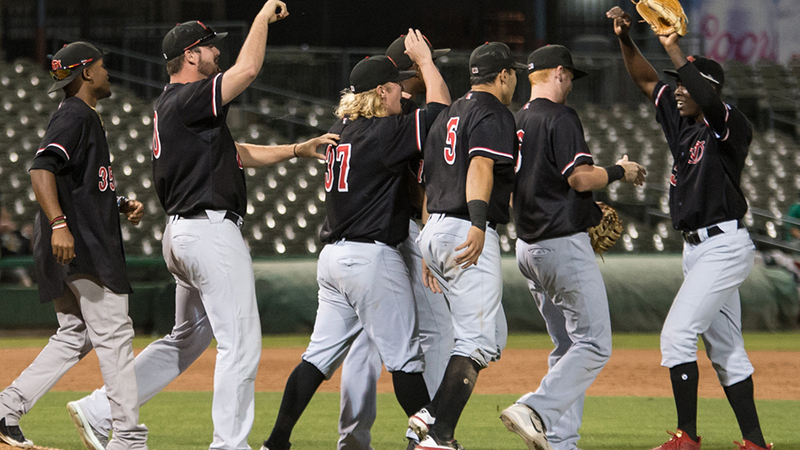 Breckin Williams, West Tunnell and Matt Brill combined to allow two hits while striking out five over the final 4 2/3 innings to lift the Rawhide to their 12th Finals appearance and third since 2014. Williams (1-0) fanned four of the six batters he faced over 1 2/3 innings. A utility player who spent parts of four seasons in the Majors with the Cardinals, Braves and Cubs, Mather is in the midst of his third season as a Minor League manager and his first full-season campaign. He led Rookie-level Missoula in 2015-16, winning the Pioneer League title in his first year. The 35-year-old moved up to Double-A Jackson last season and served as bench coach under J.R. House, who managed the Rawhide to consecutive postseason appearances in 2015 and 2016. Millburn (0-1) was charged with three runs on three hits in two innings for Stockton. One night after scoring 11 runs on 14 hits, the Ports were limited to a pair of singles by Brallan Perez in the fifth and Luke Persico in the ninth. Visalia's quest for its first California League title since 1978 goes through Rancho Cucamonga, which advanced to the Finals on Saturday night. The clubs will play Game 1 of the best-of-5 series at Recreation Park at 10:05 p.m. ET on Tuesday.